Bringing archaeological material and research to the heart of the community, the Time Truck is a vehicle for developing positive community relations through engagement and hands-on education. Find out about recent Time Truck activities here. 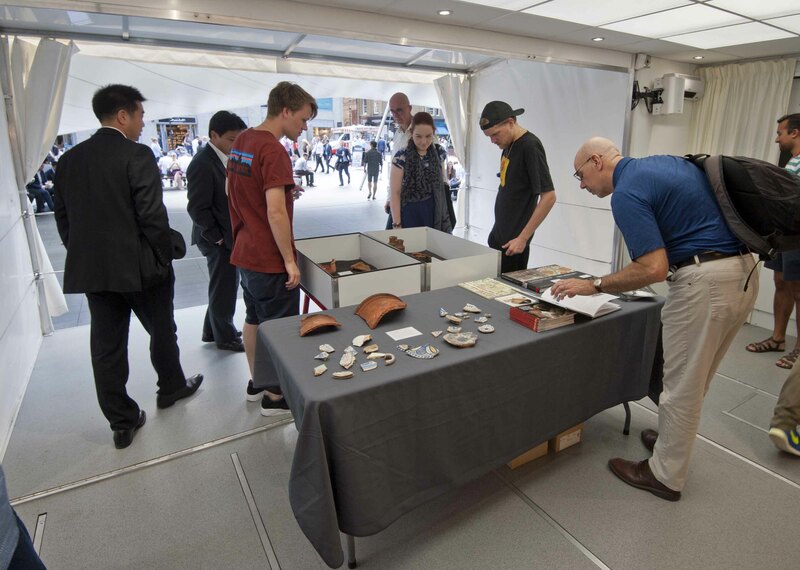 It is a flexible and interactive mobile event space, lab and classroom designed to host an exciting programme of volunteering opportunities, workshops and initiatives that evoke curiosity, encourage people to explore their heritage and enables them to discover why archaeology matters. 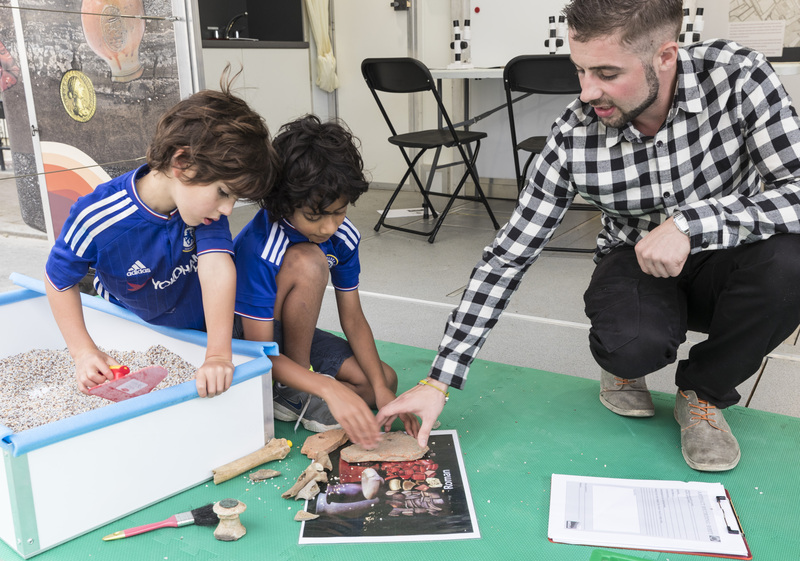 The Time Truck outreach programme for schools offers creative activities and innovative workshop sessions, enhanced by our extensive archaeological handling collections. In 2016/17 the truck, accompanied by skilled facilitators will deliver educational sessions to over 4000 children across London. If you would like to find out more about this programme, download our Time Truck Primary Schools brochure. It also provides opportunities for developers to build strong community relations both on and off site. Our programmes open up dialogue about the past and future of a site, work towards planning requirements that focus on sharing the heritage of a site with the local community, and ultimately make connections between people and places. For more information on please download the Time Truck and Sustainable Business brochure. Thanks to all of the Time Truck sponsors Brookfield and Oxford Properties, Stanhope, Cain Hoy, Galliard Homes, TP Bennett, The Garfield Weston Foundation, Wates Giving, Thames Water and the Heritage Lottery Fund. 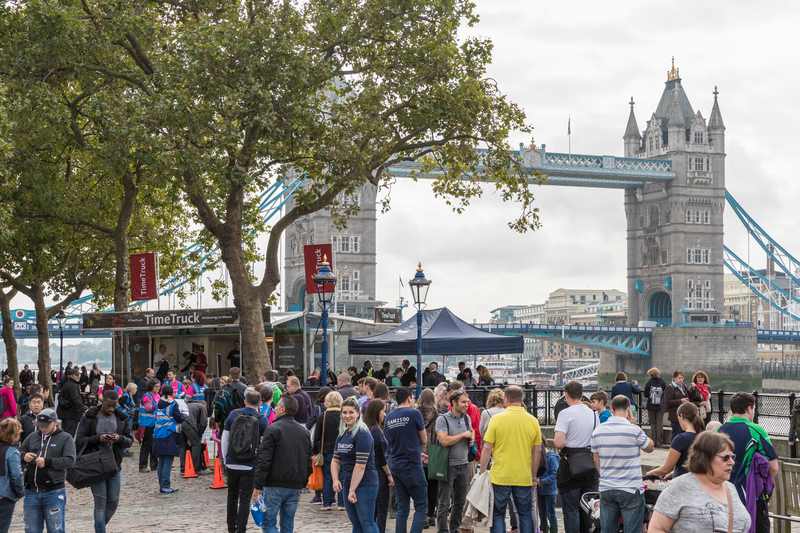 If you’re interested in becoming a Supporting Partner with special access to the Time Truck please feel free to contact us at support@mola.org.uk. The Thames Discovery Programme is one of the UK’s most successful community archaeology projects, leading efforts to record the archaeology of the Thames foreshore. CITiZAN is a nationwide community archaeology project that responds to the threat to archaeological sites on our coast and tidal estuaries from erosion.